Kale is packed with goodness, having high levels of iron, magnesium and fibre. As a result, kale has become somewhat of a super-food in recent times, though there is nothing new in this - during World War II kale played a central role in the Dig for Victory campaign due to its high nutritional value. The earthy flavour and nutrients in kale are lost when overcooked, so use a light touch. Kale can be used interchangeably with other leafy greens such as cavolo nero or spring greens. 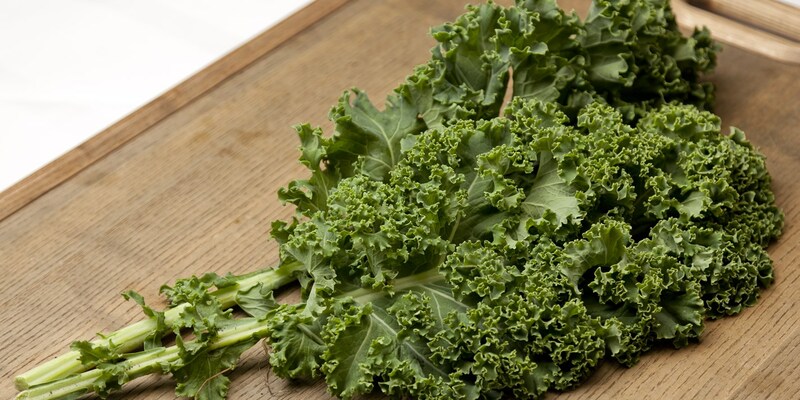 Kale, found either curly or plain, is grown in the UK throughout the winter months from late September to February. The deep green wrinkled leaves can be brought already prepped or sold whole with the tough stems still present. Unprepared kale should be thoroughly washed before using. Once picked, kale should be stored in the fridge for no more than 4 days. Kale can be enjoyed in a number of ways. It's experienced a boom in popularity in recent times thanks to its health-giving properties, and as a result is often seen raw in a number of salads, smoothies, or even deep-fried to make kale crisps. More traditional cooking methods such as blanching, stir-frying and steaming also suit apply to kale, the latter being the best way for locking in nutrients while making it slightly easier to eat than raw. Kale can also be slowly braised, cooked for 25-35 minutes in some stock or other cooking liquid until beautifully tender and sweet. This can then be served with winter warmer dishes such as pies or roast dinners. To add a bit of green to a stew or pot roast, add a handful of kale to the dish in the last 30 minutes of cooking. As it is abundant during the winter months, kale should be matched with comforting winter flavours such as evident in Graham Campbell’s Fillet of beef Wellington or Christoffer Hruskova’s wild turbot. The rich and earthy taste of kale can add another flavour and texture to dishes such as Vegetarian Wellington or Lasagne. These robust leaves can also be used to bulk up and add depth to vegetable soups such as Shaun Rankin’s minestrone. As kale is packed with antioxidants and vitamins it is perfect to be used in super-healthy, thick smoothies, dips or pâtés. For use in smoothies, blend with sweetened ingredients such as honey, summer berry fruits, ginger, banana or fruit yogurt to offset its slightly irony taste.